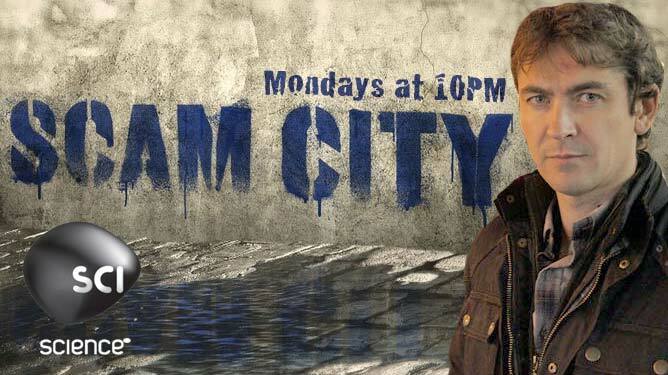 Canadians have the jump on American TV viewers in watching Scam City, a documentary series hosted by Conor Woodman now showing on SciHD. The series, which debuted on the Canadian channel Travel + Escape in June of 2012, has Woodman sacrificing himself as a ‘mark’ in order to expose scammers of every stripe, from pickpockets to doctors selling phony cures. The series takes Woodman all over the world and serves as a guidebook for tourists on how to avoid losing their money, possessions, dignity and, in some cases, their life. He even manages to charm some thieves into revealing their modus operandi. In Rio De Janeiro during carnival Woodman persuades one scammer to show how, with a partner, the thief grabs the unattended bag of a tourist glorying in the Brazilian sun, then buries the bag deftly in beach sand without the tourist ever the wiser. The thief returns with his partner when the beach is nearly deserted and digs up the buried lucre, leaving empty bags behind. Near an outdoor bar, Woodman coaxes a prostitute to admit that she drugs her marks by slipping narcotics into their drinks. The men eventually wake up to find their wallets empty, wristwatches and other jewelry gone. Some might not wake up at all, she admits to Woodman, laughing. A Rio taxi driver shows Woodman how he is able to convince tourist fares that instead of giving him 50 reals, he only received 5 reals (when, of course, the driver did receive fifty). Probably a good idea to use your phone to take a picture (or video) of yourself handing the money to the taxi driver with the denomination clearly showing. If you’re planning on doing any traveling, even if you’re on a staycation in your own city, you should take notes while watching Scam City. As Conor Woodman says in the promos, “I get scammed so you don’t.” Indeed!